Join the discussion on our forums! Come discuss Grave Horror over in our dedicated Grave Horror discussion topic. Great card in most Priest decks (besides Spiteful). Most are very spell/combo heavy and even run Lyra the Sunshard for the same reason. A better Arcane Giant for a class that got synergy. Great card. Why on earth would you put this in a Spiteful deck that doesn't run many spells??? applies to literally any big taunt though. Dont like the card but I cant deny it has sinergies. At least it has more sinergies than the priest champion. It will be good drop after playing Psychic Scream. i like that priest is trying to be pushed into this direction instead of otk route. Well, could be good in spell based deck with the Weapon and the Spellstone. Great 0-cost giant if able to pull of the Spirit of the Dead and Bwonsamdi, the Dead. It comes back as a 1 mana card in hand, and if you've cast any spells this game (and you would have if you're playing this card.) it gets reduced to 0. 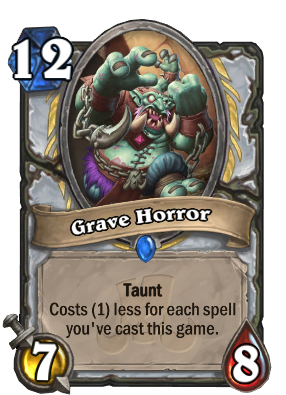 Add the priest spellstone and various other shenanigans, and you're getting a virtual wall of 7/8 taunts. Agreed. Don't know if Big Priest or Resurrect Priest will be a thing again though because of some aggro decks like current zoo or if Pirate Rogue becomes a thing. Too early to tell. So the fact of many priests decks being spell mostly didn't go unnoticed. Good card. Holy sh*t! This is pretty good.